Outstanding views of pink cliffs bring you maximum rewards for minimal effort on this short, easy hike. To the right of the parking area is a sign marked “TH” (trailhead). From here, the trail leads northwest towards Cascade Falls, contouring along the pink cliffs for the length of the hike. As you begin, you pass through a stand of conifers—spruce and fir trees mainly—with some bristlecone pines and aspens mixed in. 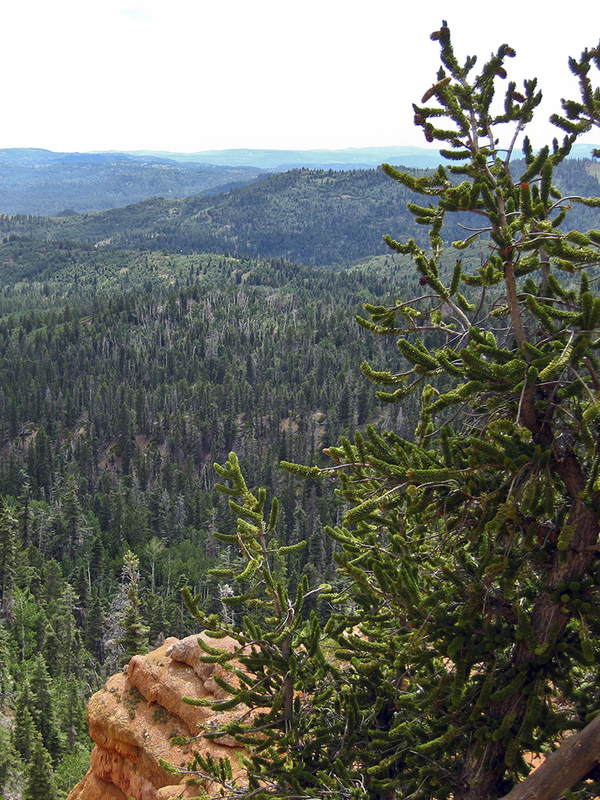 But the forested view opens up as you come to an overlook at 0.2 mile. Two benches there provide a spot to rest and enjoy the incredible vista stretching all the way to Zion National Park. 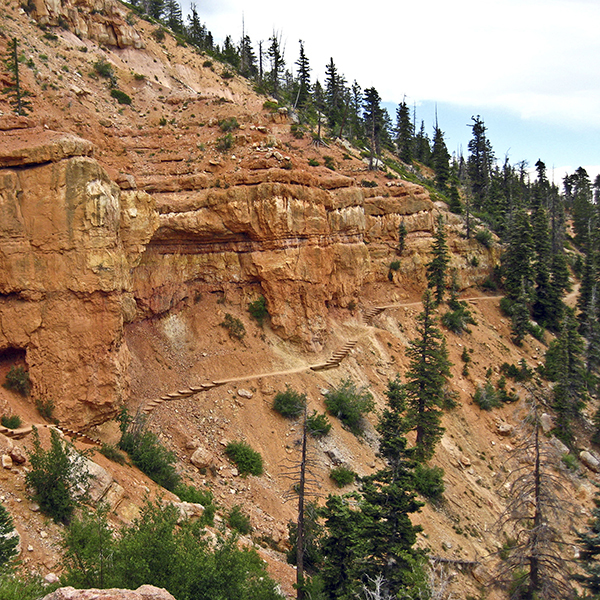 The trail continues straight ahead, staying mostly level for a pleasant stroll along the sherbet-colored cliff face. The hoodoos and pinnacles in front of you characterize the geology of the area. They’re carved from the Claron Formation, the same rock layer found in Bryce Canyon and Cedar Breaks. 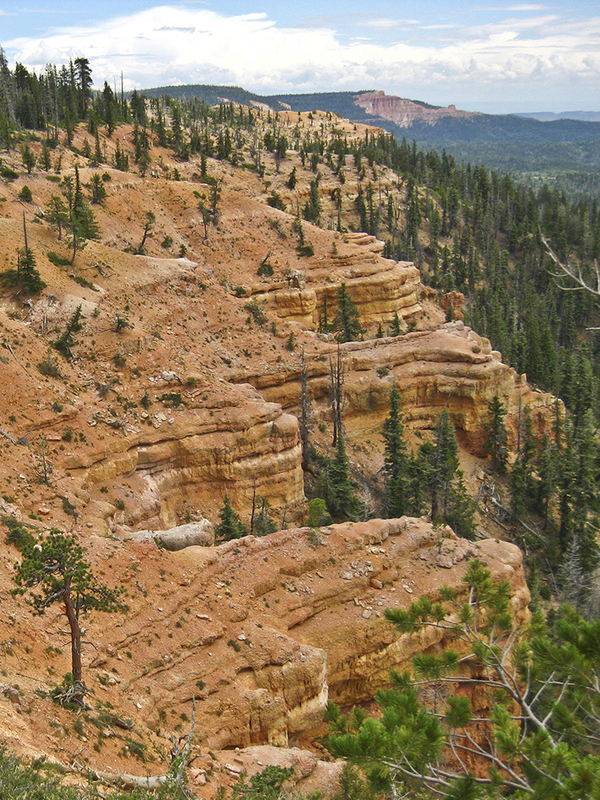 Alternating layers of limestone and sandstone erode at different rates, thus creating the otherworldly shapes of hoodoos and other formations. 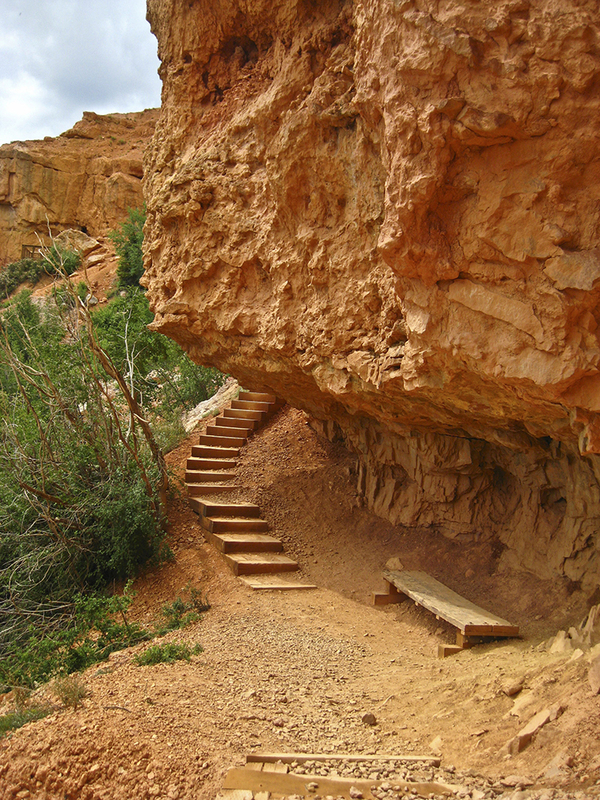 Hugging the side of the cliff, the trail undulates gently, with a few wooden steps and bridges to cross. After a half-mile, you come to a rock overhang with a bench beneath it. Stairs lead to the end of the trail, where an overlook places you within feet of the waterfall (0.7 mile total). 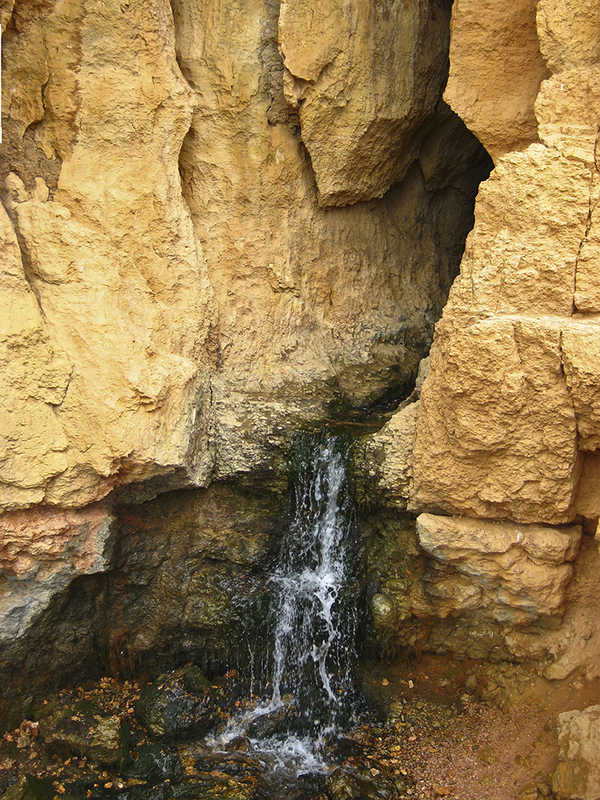 The water flowing from the cliff comes from an underground cave and river system. Water from nearby Navajo Lake leaks out of a sinkhole and travels through subsurface lava tubes to the opening of the cave in front of you. Traveling into the cave system is not permitted because of low oxygen levels and potentially high water flows. Depending on the water levels at Navajo Lake, Cascade Falls can range from a roaring waterfall to a thin stream. From here, the water eventually flows into the North Fork of the Virgin River that runs through Zion Canyon. Please respect the falls and observe from the lookout. Return to the parking area by following the same trail. From Highway 89 north of Kanab, turn west onto UT 14. Follow this road, passing Strawberry Point at 7.7 miles and Duck Creek Pond at 12 miles. After traveling 13.6 miles, you reach an intersection—Duck Creek Visitor Center is to your left, the campground to your right. Turn left towards the visitor center, which is worth a quick stop for informational pamphlets, maps, and field guides. Continue along the crushed gravel road that immediately bends right, away from a gate and OHV trail. At 13.7 miles, Singing Pines Trail branches left. Stay right, and shortly thereafter (13.8 miles) veer right again at the junction with FR 59. Look for a sign, “Cascade Falls 3 miles.” At 15.4 miles, you reach another junction with Cascade Falls to the left and Navajo Lake to the right. Stay left, continuing another 1.5 miles before reaching the trailhead (17 miles).